“Bajari” comes from the dialect of Puerto Rico’s Taíno Indians and means "high distinction, respect and honor." Bajari — a new brand of locally produced, gourmet chocolate bars — have been added to the inventory at Walgreens, which will double the maker’s monthly production and may open doors for exporting to the U.S. mainland, company officials announced Tuesday. 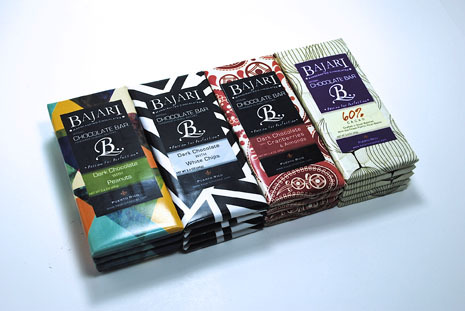 Bajari Handcrafted Chocolates was founded in 2010 by young entrepreneur Paul Curran and is dedicated to handcrafting of chocolate bars using local cocoa and a combination of sweeteners, nuts, fruits and coffee of the highest quality. In addition, it has truffles stuffed with a variety of Caribbean flavors and liqueurs. “Our island has many charms but none defines us as more people than our agriculture. For generations we have preserved the land, its fruits and the recipes that define us,” said Curran. “Being able to integrate chocolate into the long list of products produced by Puerto Rican hands and make them accessible in a world-class store like Walgreens, helps grow our local economy,” said Curran. The products have been available at Walgreens since early April, in three dark-chocolate varieties. “Having the opportunity to compete head-on with globally recognized brands makes us validate the effort, sacrifice and quality of manufacturing our chocolates and to highlight the gastronomy of our island,” said Curran, winner of the first edition of the Hit 3001 program. Let’s continue the innovation and determination to move our farming to new levels! ! Hey Buddy!, I found this information for you: "Locally produced Bajari chocolate arrives at Walgreens". Here is the website link: https://newsismybusiness.com/produced-chocolate-walgreens/. Thank you.